As its length [about an hour] suggests, this was a leisurely “In C,” and it began [at Le Poisson Rouge on Sunday the 8th] with a prelude of sorts: a rich aural haze surrounding a honking, spirited saxophone line that darted about for five minutes before the steady, pulsing C signaled the start of Mr. Riley’s work. 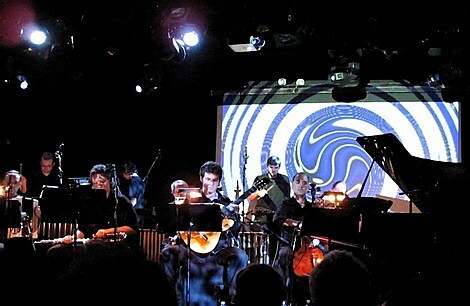 The ensemble, which included standard strings and woodwinds, as well as a few guitars, an accordion, a piano and percussion, moved between extremes of dense, flowing textures and transparent pointillism, with Mr. DeSantis’s additions — including what sounded like instrumental sounds played backward — occasionally providing otherworldly effects. That’s a review of the ‘In C Remixed’ album release concert that took place at (Le) Poisson Rouge on Sunday, November 8th. The night’s performers, Grand Valley State University New Music Ensemble, were joined by ‘remixer’ Dennis DeSantis on laptop and electronics. The piece moved casually and steadily, and wasn’t without its charms (the opening sax breakout noted above was an especially warm introduction), but my only regret was not finding a chair for the hour-long take. The two pictures here are from that show. The 2007 “best” In C performance referenced above will happen again when the Darmstadt series brings “In C” back to Galapagos on Monday, November 30th. The performance celebrates the five year anniversary of the series, which is curated by Nick Hallett and Zach Layton. For the piece they’ve recruited “a battery of avant-guitar gods (David Grubbs, Alan Licht among them), veteran composer-performer Jon Gibson (who played in the very first performance of In C), singers, instrumentalists across a wide span of tones and timbres, electronic musicians….all keeping to the beat of drummer Ryan Sawyer.” All that and visuals by Joshua Light Show (who did the trippy background for Yo La Tengo at Roseland in September). Tickets (only $10+fees) are on sale. On December 3rd, 4th & 5th, Darmstadt: Classics of the Avant Garde series will bring its second annual “Essential Repertoire” festival to the Issue Project Room. The theme for this year’s fest focuses on the “30th anniversary of the seminal New Music New York concerts curated by Rhys Chatham and held at The Kitchen, which put the still-burgeoning Downtown Scene…under a mainstream spotlight and redefined the presentation of experimental music.” The concerts are programmed accordingly, with music from “‘Blue’ Gene Tyranny, Connie Beckley, David van Tieghem, Jill Kroesen, Jon Gibson, Ned Sublette, Peter Gordon, Peter Zummo, Petr Kotik, Phill Niblock, and a performance of Meredith Monk’s Dolmen Music by the M6 (who are at the Stone in December). Advanced tickets for night one are on sale, but not for two and three. If more Terry Riley is your thing, he’s been announced as the artist-in-residence at this year’s Big Ears Festival in Knoxville, TN, March 26th-28th. A retrospective of his work will take place during the fest, and that’ll be sure to include “In C.” Tickets and more info TBA. 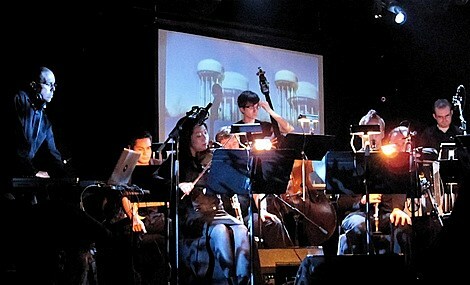 This year’s festival celebrates the 30th anniversary of the seminal New Music New York concerts curated by Rhys Chatham and held at The Kitchen (then on Mercer Street), which put the still-burgeoning Downtown Scene – at the crossroads of minimalism, interdisciplinary performance, and various strains of post-punk – under a mainstream spotlight and redefined the presentation of experimental music.